It was the first year of undergraduate studies and I remember Slam Books were very popular at that time. I had mine since the end of school days and only a couple of pages were left to be filled. There was a long list of boys who wanted to fill my Slam Book, but I wanted to learn only from two of them. To answer one of the questions, when asked to describe me, one of them wrote, “a beautiful girl who does not smile as much as she should…” I probably did not know then that it was true. I first came to know about Frida Kahlo‘s self-portrait in the Bengali movie Antaheen (2009). I did not watch the movie when it was released but I watched it much later. When they showed the painting in the movie, it looked surrealistic. Her face had a somber expression, she was surrounded by a monkey, a cat, and a hummingbird and wore a necklace of thorns. with blood dripping from it. I was very intrigued. Being a huge movie buff since childhood, I remembered that the movie Frida (2002) was nominated for a number of Academy Awards – I have a special place for Salma Hayek and maybe that is why I remembered it. 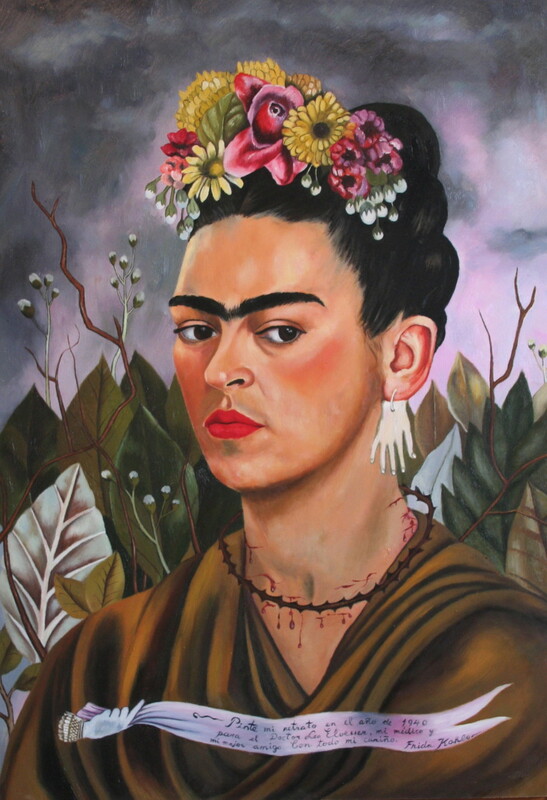 I immediately researched about Frida Kahlo and found her other paintings. When I looked at them, I was taken aback and frankly, very shocked. Her portrayal of herself seemed violent and sometimes, just looking at the paintings was painful. Since childhood I have been very intrigued by the human condition. I remember when I went to Belur Math, as a child, instead of being mesmerized by the beauty and calmness of the place, I was fascinated with the young monks who lived there. For months I could not stop thinking what led young adults to leave their homes, every contact with their family and choose a life like that. But over the years, often the inquisitiveness would turn into sadness and since I knew I would be sad I tried to push these thoughts to the black corner of my mind and forget about it. That is what I did in case of Frida. I closed the images, and suppressed my inquisitiveness. Maybe I was scared that if I went digging in I will discover something that I did not want to know about. Many years passed and in 2013 I visited MoMA in New York city. MoMA was fascinating to me, I will write a whole another post about how much I felt inspired after I visited MoMA if I ever get that much time. 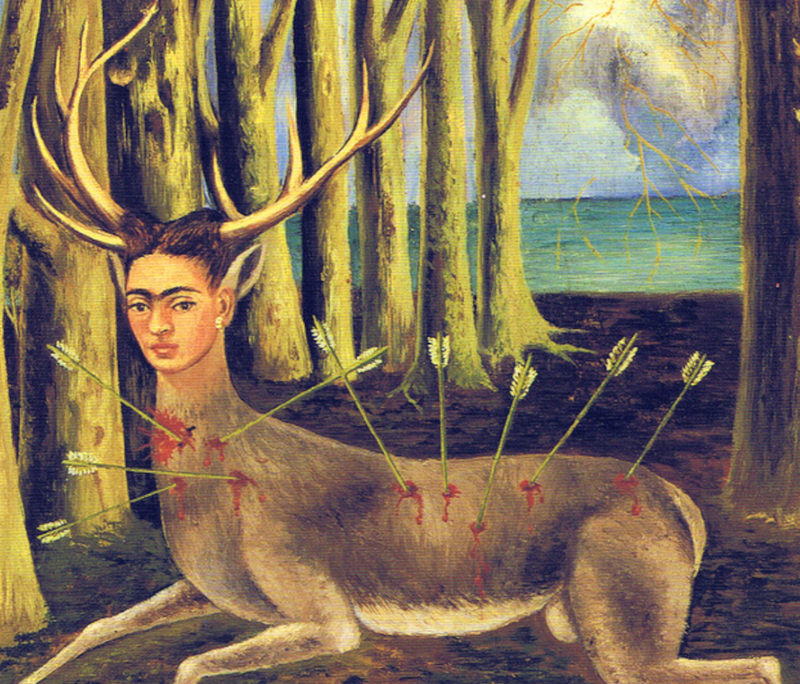 There, once again, I came across works by Frida which were not as violent as the ones I had seen on the internet before. I was curious and wanted to watch the movie Frida, but when I watched the trailer I decided to watch it later and then I kept postponing it, because I was not sure I will like it. In 2014 December my friend visited La Casa Azul in Mexico City. When he came back he brought with him tons of photos of the place, specially the kitchen and he told me that I would have loved that place. I kept looking at the photos and kept wondering why would I have loved the place and if really I would. In architecture I prefer very modern clean lines, simplistic furniture, light colors and bright open spaces. This place looked quite the opposite. It was loud and rustic and the kitchen tools looked like art, not really useful. But it was fascinating. Every corner of the house looked like the person who lived there had paid special attention to it. I have not been to the museum myself so I am not sure if the Mexican authorities kept it as Frida (or may be Diego) had left it. But I like to think it is. I started reading about Frida and what her work represented. Why did she portray herself in such violent details? What did they signify? 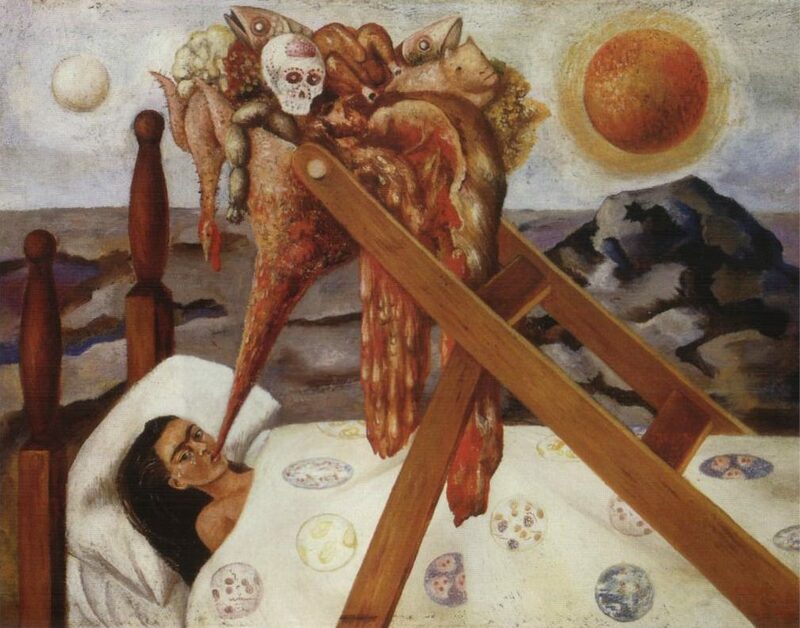 I came to know about her accident, her chronic pain, her political activism and her tormented relationship with Diego Rivera. A few months later I watched the movie Frida, which depicts the professional and private life of Frida Kahlo. It stars Salma Hayek in her Academy Award-nominated portrayal as Kahlo and Alfred Molina as her husband, Diego Rivera. If you have not watched it yet, I highly recommend it. Salma Hayek‘s portrayal of Frida Kahlo is poignant. I loved the cinematography – throughout the film, a scene starts as a painting, then slowly dissolves into a live-action scene with actors. I was moved when I watched the movie. When I watched the movie I had already read so much about her, so I was not expecting to be overwhelmed like that. There are many good movies that you watch and forget. There are good movies that you watch and remember. And there are good movies that influence you. Frankly it was not the movie itself, but watching this movies was like the amalgamation of all the information I had collected about Kahlo. This movie stayed with me. Even though many good things happened in 2015, it was the saddest year of my life. In my experience when you are sad for a long long time, that sadness becomes something physical, like a pain. Like a pain through your spine, like a lump in your throat, like a migraine that no medicine can cure. 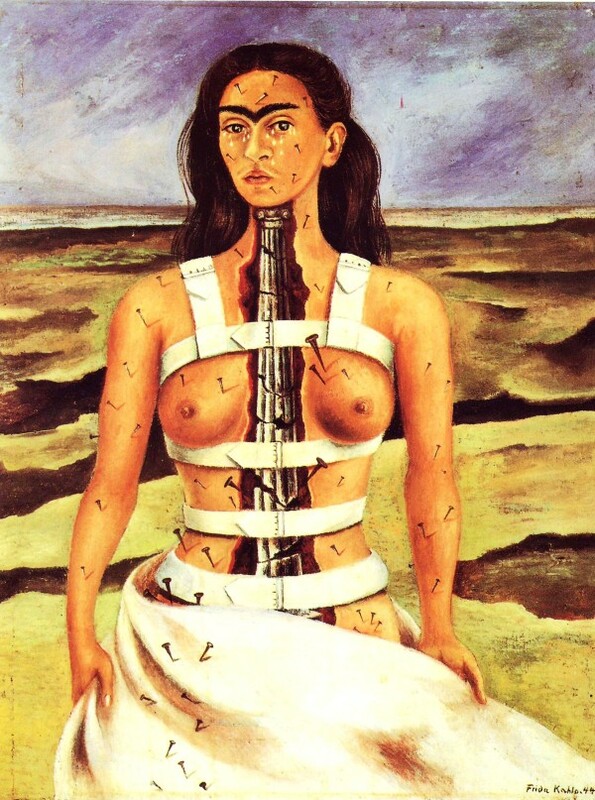 In no capacity I am comparing my pain with that of Frida’s but as the year progressed, I started to identify with her more and more. I have wanted to write a blog about the movie or Frida Kahlo for a long time. But it seemed a daunting topic. But in the past few months I found myself going back to her work, specially her self-portraits again and again. I have never been that girl who uses others’ pictures as her profile photo or borrows fancy quotes to describe her feelings- because I always felt that was very pretentious. But somehow, I feel that I can identify with Frida. In case of Frida, the more I learned about her life, the more I started to appreciate her work. Initially I thought her work was grotesque and violent. But now I feel that there was a lot of passion and depth in her paintings. In her works, some people notice only her uni-brow and moustache, some people see only pain, but I see irony and humor along with the pain that she felt. I think what draws me to her is that she was a fighter. Many incidents in her life could have diminished her spirit, like the crippling accident, the health issues, or Diego’s infidelities. But she was not crushed by anything. She reminds me that: Pain… is strength. All photos are sourced from Google.